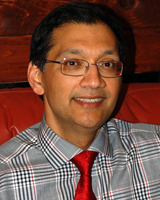 Dr. Harshad Telang graduated from the University of Ottawa's School of Medicine, after which he went on to complete his residency in Thunder Bay through McMaster University. Dr. Telang was appointed Regional Director /Coordinator of McMaster University's General Surgery Program in 2001, and has held the post since that time. From 2010 to 2012, Telang was the Program Director with NOSM"s General Surgery Residency Program. Dr. Telang currently holds the rank of Associate Professor at NOSM, as well as Assistant Clinical Professor of Surgery at McMaster University. Dr. Telang succeeded Dr. Alice Wei upon completing her term as President on the weekend of the OAGS Board Meeting (Feb.3, 2018). Dr. Wei will remain on the OAGS Board in the position of Past President. NOTE: (e.) is indicative of the original or first full calendar year served on the OAGS board of directors, although he/she may have been formally elected during the annual meeting election several months prior (Nov.). Two-year terms follow the calendar year. Last updated Feb. 2019. *OAGS BOARD ELECTION Nov.3, 2018: There was one nomination for each of the staggered board positions (7). With no other nominations received before the deadline 2 weeks prior to the election, there was no election during the OAGS business meeting on November 3, and the individuals nominated were acclaimed to their positions. 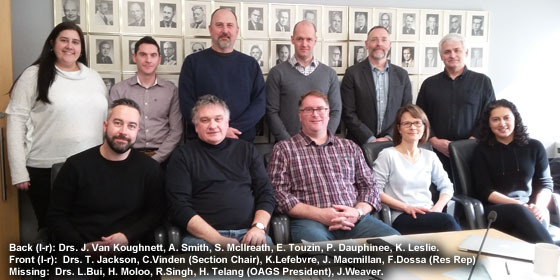 The officer positions were appointed by the board of directors during the winter board meeting (Feb.9/19) following the OAGS Annual Meeting Board Election. *OAGS BOARD ELECTION 2019: The deadline for applications/nominations will be 2 weeks prior to the next OAGS Annual Meeting. For more details: www.oags.org/election.html . BYLAW: As of November 3, 2012, the OAGS membership voted to approve the new Bylaw #4, an excerpt of which applies to the length of board terms. "A director whose term (2yr) has expired shall be eligible for re-election, up to a maximum of five (5) consecutive terms in total. This term limit does not apply to officers of the Board, who may serve in an officer position for up to a maximum of four (4) years per position, irrespective of how long they have already served on the Board. These term limits can be extended by the Board, at their discretion, in exceptional circumstances." Economics & MSPC/Tariff Committee Dr. Kevin Lefebvre (Chair). (Manpower Monitoring) Drs. R. Singh,(Chair), K.Leslie, E. Touzin, A.Smith, Chris Vinden. Membership Committee (applications/standards) Drs. P. Dauphinee, H. Telang, J.A. Van Koughnett. Political Activity Committee Drs. P.Dauphinee, K.Lefebvre, S.McIlreath, R. Singh, H. Telang, C. Vinden, A. Wei. Ad Hoc: Cancer Care Ontario Committee Drs. C. Vinden, P.Dauphinee, K. Lefebvre, S. McIlreath, J.Weaver. Ad Hoc: OMA Council Delegates Section Delegates: Drs. C. Vinden, A. Wei. Ad Hoc: Peer Support Committee Dr. R.Singh (Chair/Point of Contact) and Executive At-Large depending on surgeon's preference/location/sub-specialization. Ad Hoc: Quality Management Committee (i.e. NSQIP, ERAS) Drs. T. Jackson (Chair), P.Dauphinee, K. Lefebvre, J. Macmillan, H.Moloo, R.Singh, H.Telang. Ad Hoc: Research Committee Dr. J.Van Koughnett (Chair), Dr. H.Telang (Pres), Drs. T. Jackson, H.Moloo, A.Smith, J. Weaver. Consultants: ResRep. Ad Hoc: Sponsorship/Exhibiting Committee Drs. J. Macmillan(Chair), L.Bui, T. Jackson, K.Lefebvre, , J.Weaver. Note: Committees can consist of both OAGS Board Members and OAGS Members. Last updated Feb.2019.